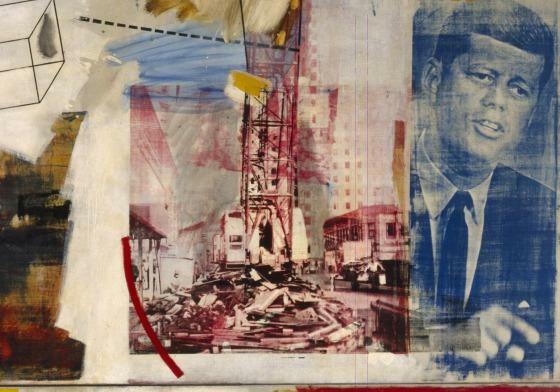 Robert Rauschenberg's gigantic Skyway was originally commissioned by the renowned architect Philip Johnson. It appeared on the facade of the United States pavilion (designed by Johnson) at the 1964 World's Fair in New York, along with paintings by Andy Warhol and Robert Indiana. All three artists shared an interest in popular culture that arose partly as a reaction to the grand existential claims made by abstract expressionist artists and critics. For Johnson's daring scheme, Rauschenberg created a work consisting of two 9 by 16 foot canvases mounted on panel pieces, one placed above the other. Within this colossal painting the artist juxtaposes photographic images from popular magazines, then-current advertising, and world events, with silkscreened images of Peter Paul Rubens's 17th-century painting, Venus at Her __Toilet. 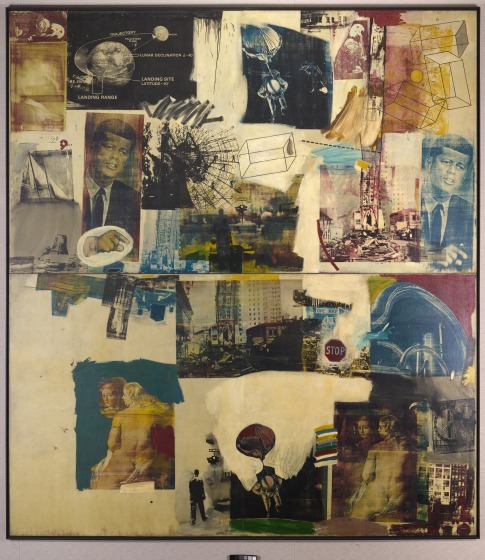 For Rauschenberg, Rubens is a figure of particular significance both because of Rubens's extraordinary artistic facility, and his international scope of activity. It is possible that Venus's mirror, which duplicates the world, may also be a symbol of art, in which case, this Venus image might be seen as an ironic self-reference to Rauschenberg himself as an artist. Also prominently incorporated within this epic work are images of John F. Kennedy. 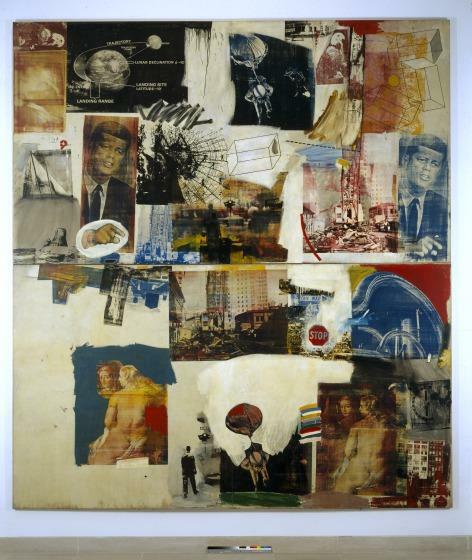 The artist uses the President's photograph, not as a means to evoke any particular social comment, but because at the time of Kennedy's administration it appeared so frequently that Rauschenberg believed it recalled a standard, unthinking response, more like a general American cultural emblem, similar to an image of Uncle Sam. Other images featured in this collage include floating astronauts and spinning planets, a man in the street an urban construction site with a stop sign, a freeway cloverleaf, the American eagle, and a drawing of a rectangular box. 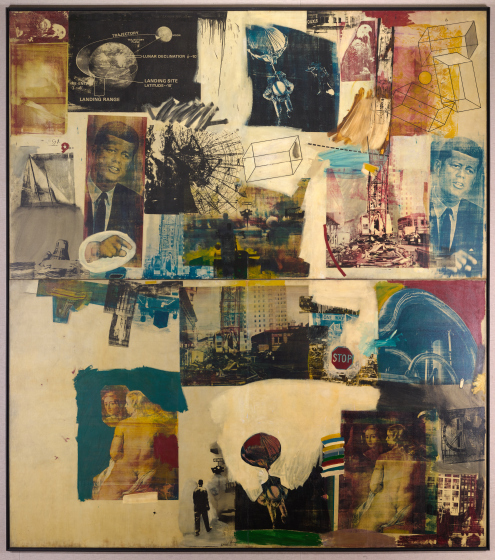 Skyway is an important milestone in Rauschenberg's career, because in this work he abandoned the sculptural elements of his earlier, groundbreaking "combine" paintings in favor of the flat plane of the canvas. 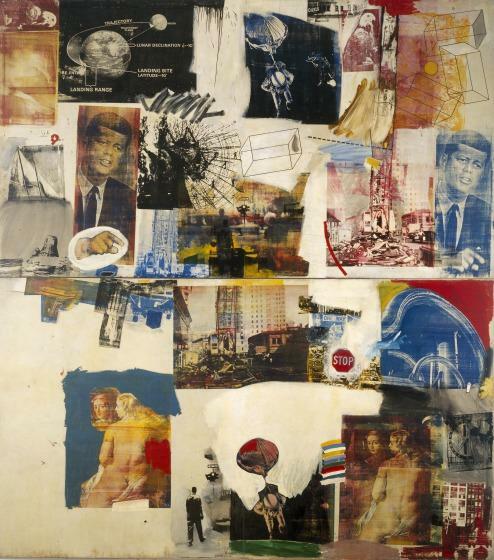 Highly evocative of recent American events, Rauschenberg's silkscreen paintings of the early 1960s connect him to the traditions of history painting of centuries past and are an important record and reflection of a mythical era in the American imagination. The use of mass media images by pop artists in the 1960s changed the way we define culture, which became more widely understood as mirroring the activities of an entire society. Sue Graze, DMA Acquires Rauschenberg's Epic 1964 Skyway, DMA Bulletin Summer 1986, 2-4. Charles Wylie, "Skyway," in Dallas Museum of Art: A Guide to the Collection, ed. Charles Venable (New Haven, NJ: Yale University Press, 1997), 280. Bonnie Pitman, ed., Dallas Museum of Art: A Guide to the Collection, (Dallas: Dallas Museum of Art; New Haven and London: Yale University Press, 2012), 301.